"I Dice Big Putts" is a hybrid Dice and Golf game. Take your full set of clubs and try your hardest on 9 great courses to try and get under par. You've got control of power and angle, but the wind is working against you. You roll the dice and try to make a hand containing 3/4/5 of a kind, or a run (small/large straight) to power your next shot. 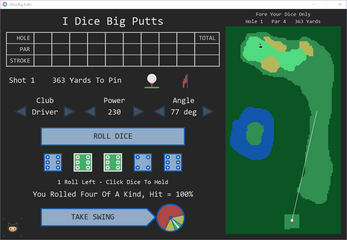 Install the correct version (Windows or MacOS), unzip and run "I Dice Big Putts.love".